The FreeCodeCamp.com Record Collection check point with the instructions laid out in comments. // First we need to understand that collection is an object with children objects. // Each of those object properties have a child object. // Of those album & artist are strings and tracks is an array. // update or set the value for that record album's property. // push the value onto the end of the album's existing tracks array. // delete that property from the album. Use bracket notation when accessing object properties with variables. Push is an array method you can read about on Mozilla Developer Network. Parameters are variables that represent the values that get passed into your function from the function call. Notice how the variables level and score in the function definition addScore are called parameters. You define a function with parameters, you call a function with arguments. hello("Joseph", "@revisualize"); // "Hello Joseph @revisualize, How is your day?" hello("Bella", "@bellaknoti"); // "Hello Bella @bellaknoti, How is your day?" hello("Andy", "@dirn"); // "Hello Andy @dirn, How is your day?" You can use the fName and uName parameters just like a variable inside of your function. * A function can have zero parameters. You still have to use the parentheses to define it. * A function might have no return statements. 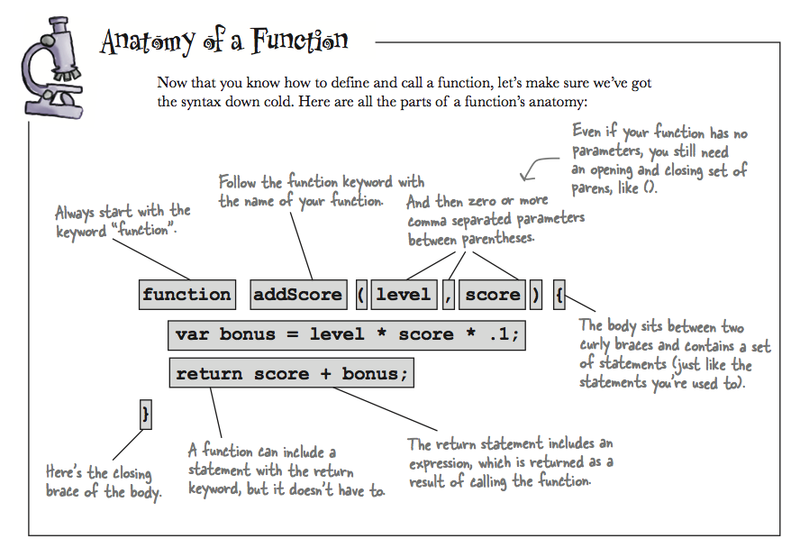 In this case we say that the function returns undefined.